The first time I met my adult student Mary, she was skeptical but desperate. She was a treasured bus driver for the local school district and had recently received word that the route she had driven for 20 years was about to change. She would have to navigate a new route filled with unfamiliar street signs. Mary had come to the literacy council where I worked to confront the secret she had kept for decades from coworkers, friends, and family: She couldn’t read. At first, she doubted I could help, and I have to admit, so did I. I had to imagine other, more qualified teachers had tried and failed before. Although this was my first formal teaching position, I wasn’t totally lacking in experience. The prior summer I had prepared for teaching at the literacy council by taking a workshop in the Wilson Reading System, a literacy program based on the Orton-Gillingham method. I practiced the method with students at the Children’s Dyslexia Center in New Jersey and found that the approach, when followed with fidelity, effectively taught reading to children in even the most difficult cases. Nothing had seemed to work for Mary before, but maybe no one had given this method a try. To our amazement, in a few short sessions the concepts that had eluded Mary for decades began to stick, until she was reading and spelling on her own for the first time in her life. More than once we ended sessions with tears welling, touched by her newfound access to print. But equally palpable was the realization that she could have learned to read all along but hadn’t been exposed to the right approach. The method Orton and Gillingham devised was phonics-based, systematic, explicit, and highly structured, with multisensory elements to help learners retain the concepts that eluded them. This is the same method we call Structured Literacy today. Because Structured Literacy was originally devised to support students who struggle with reading, many educators assume that the approach is only for remedial instruction. But Structured Literacy is appropriate for the general education classroom because it supports the reading acquisition of all students. When a Structured Literacy program is taught in general ed classrooms, teachers may find that 5 to 10 percent of students will still struggle to master the concepts and need to be referred to intervention to intensify instruction. A unified Structured Literacy approach within a school’s Response-to-Intervention (RTI) framework allows teachers in each tier to use the same curriculum to scaffold the learning and intensify the instruction as needed, with extra repetition, smaller group sizes, and/or increased instructional time. In Structured Literacy instruction, teachers guide students through systematic mastery of the smallest units of sounds (phonemes) and build upon that knowledge by introducing new, more complex material (morphemes and lexemes) in a structured and cumulative way. Structured Literacy teachers are explicit about the ways English is predictable and unpredictable by teaching the linguistic rules behind spelling and the exceptions to those rules. In Structured Literacy lessons, teachers work on phonemic awareness, decoding skills (blending phonemes to make words), encoding skills (segmenting words into phonemes or morphemes), sight words, and reading fluency. Teachers follow the scope and sequence, covering one syllable at a time until all six syllable types are taught (closed, open, vowel-consonant-e, r-controlled, vowel pair/diphthong, and consonant-le). 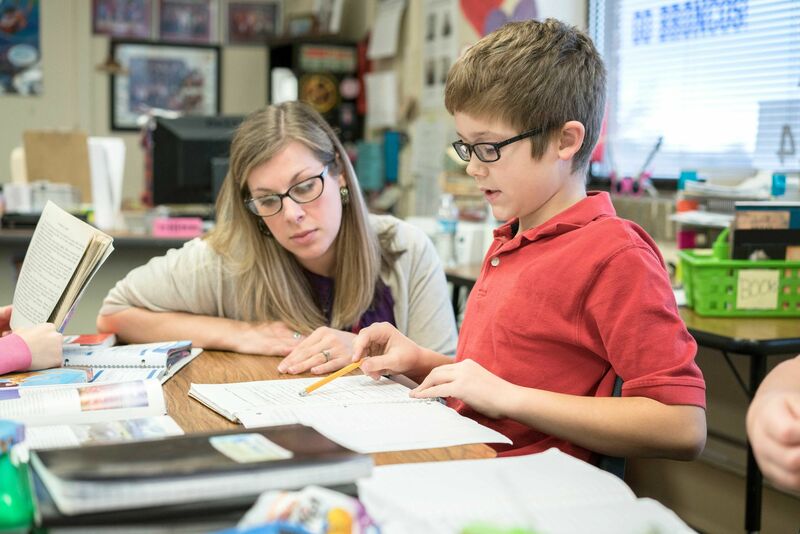 Teachers cover these key components of reading instruction: phonemic awareness, phonological awareness, reading (decoding), spelling (encoding), sight words, reading fluency, and comprehension. In Structured Literacy instruction, teachers review previously taught concepts in each lesson and introduce new material to keep the student stimulated and engaged. Built into this design is the understanding that while a student who doesn’t struggle with reading difficulties can master a concept in one to five exposures, a student who struggles with reading difficulties may take upward of 25 exposures to master a concept. Structured Literacy teachers are also diagnostic, evaluating concept mastery both informally in each lesson (through reading observation and written dictation) and formally at the end of each step in the scope and sequence. Teachers respond to student progress or lack thereof by moving at a pace led by student progress, not the curriculum.